Win extra cheese for college! 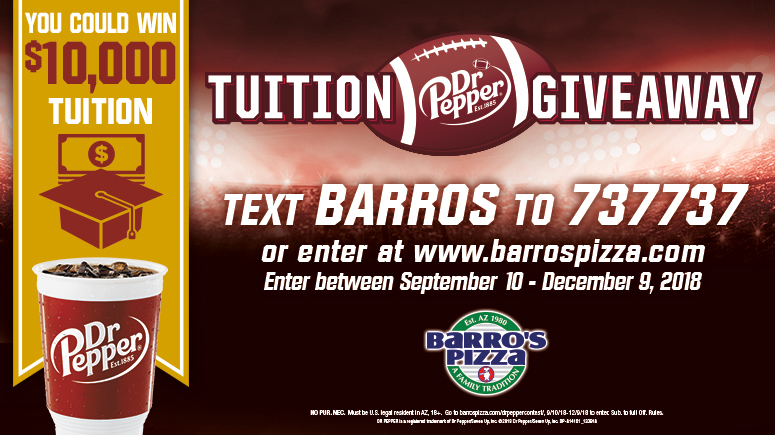 Enter daily from September 10th – December 9th to win the Barro’s Pizza & Dr Pepper $10,000 Tuition Giveaway. One lucky winner will be chosen at random! NO PURCHASE NECESSARY. Must be U.S. legal resident residing in the state of AZ, 18 or older. Limit 1 entry per day/91 total. You may not use more than one name or residential or email address. You must complete your own entry. No use of any automated, form filling, programmed or similar service or system. For Official Rules/details click here. Void where prohibited. DR PEPPER is a registered trademark of Dr Pepper/Seven Up, Inc. ©2018 Dr Pepper/Seven Up, Inc.